I love a good statement shirt - if it has a collar and something jazzy all over it I will probably have to have it so when I saw this amazing Lavish Alice number I freaked a little. 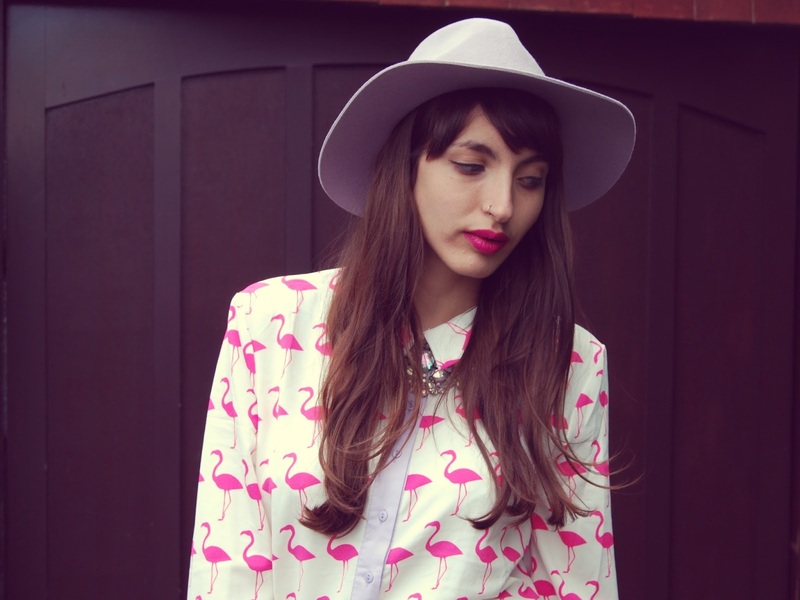 Animal print has been hugely popular the last few years following VB's cats and Topshop's swans but it doesn't get much better than bright pink flamingos. Yet it does, as the lilac detailing is the perfect finishing touch to this piece and gives it that SS14 twist. Following on with the flamingo theme, it just felt right to wear this with my Topshop fluffy pelmet skirt. It may be a little too literal for some but despite the similarities to flamingos themselves, I liked the soft, fun texture of the skirt against the crisp tailoring of the shirt and the pastel pink allowed the print to stand out. it also happens to match perfectly with these pool slides from Zara which have barely left my feet the last couple of weeks, they are the comfiest things in the world and haven't rubbed once! With any sickly sweet outfit, I always like to 'rough it up' with a biker and it'd have been rude not to get the lilac fedora in when it was spot on with the shirt! I think I am bordering on obsessive with the headwear at the moment but they just finish every outfit off perfectly! I love your shirt, the flamingo print is wonderful and looks so good with the texture of your skirt. Love your slides too, they're on my wishlist! Absolutely cute,chic,glamorous and girly! Well done!